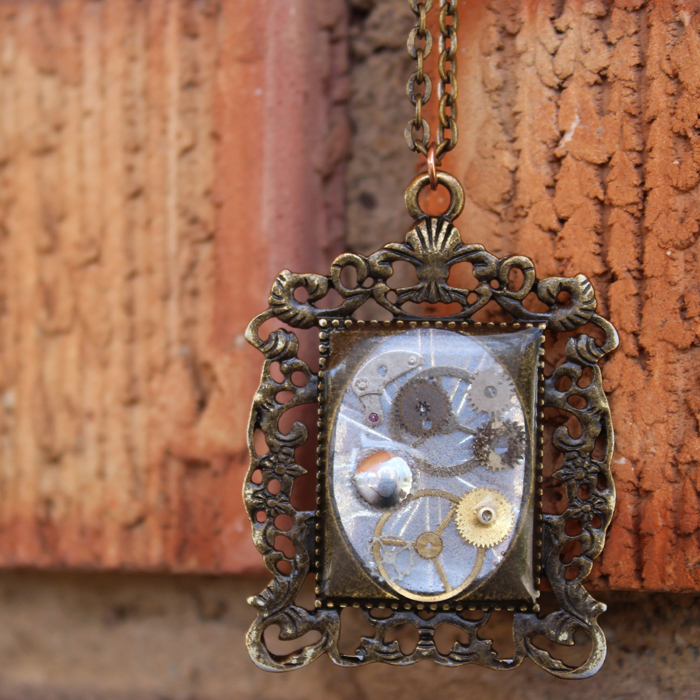 Are you familiar with Steampunk? Steampunk is a Sci-Fi fan fiction genre that is “olden day futuristic”.It’s like what people in the Victorian age thought the future would be like. So it’s full of Victorian themes; watch gears and cogs, aviation goggles, top hats, corsets, bronze age, steam power, machinery… but not modern technology. Awesome, right? Steampunk costumes and cosplay are extravagant and over the top! 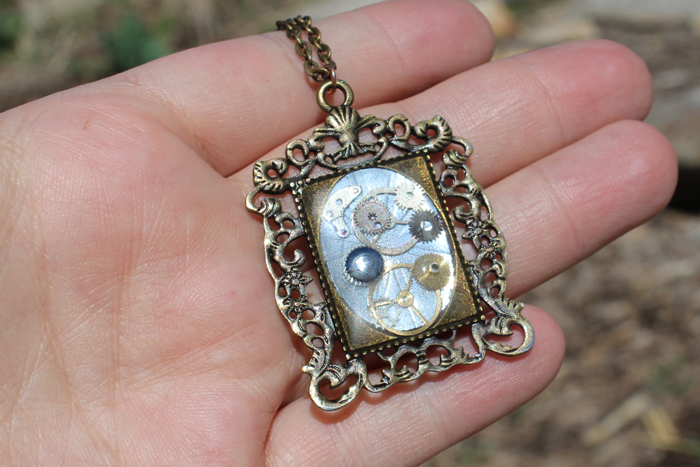 Steampunk themed jewelry is so intricate and interesting! It’s easy to make yourself! 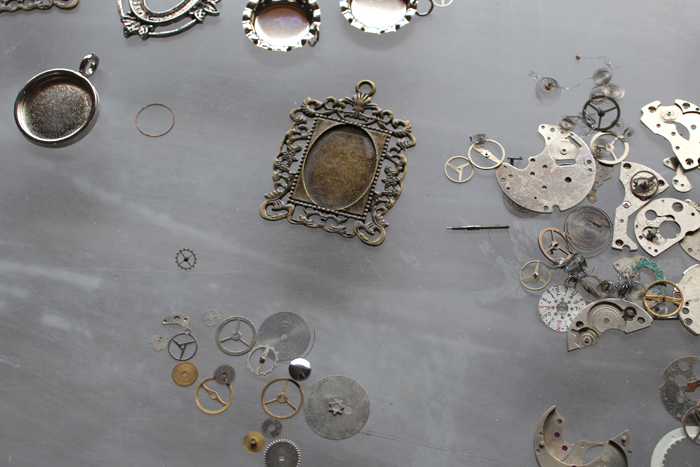 Start by picking the bezel of your choice and the watch parts that you like to go with it (all of these items are available in the jewelry section of your craft store). Cut a piece of scrapbook paper the size of your bezel opening. I used chrome embossed paper. 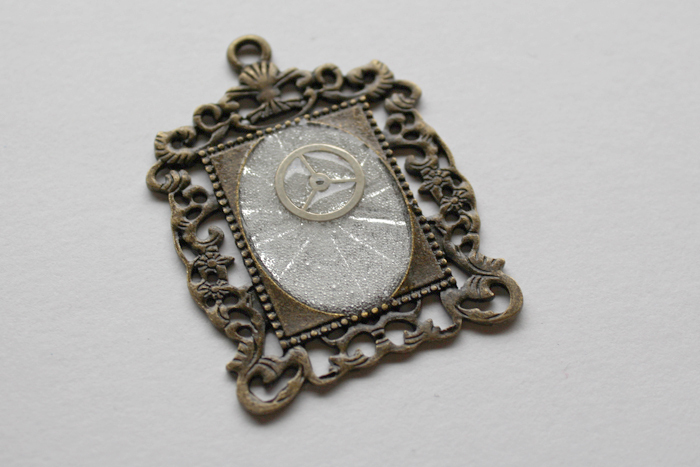 The embossed paper gives the piece an additional Steampunk element. 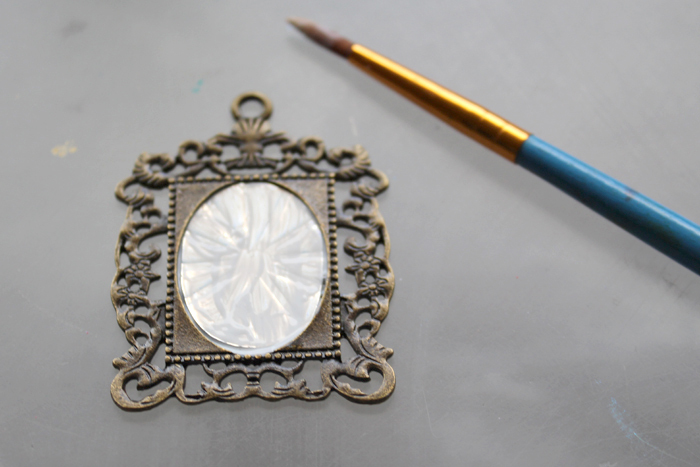 Put a dot of white glue or mod podge on the bezel. Paint it over the surface, then place the scrapbook paper on top. Paint more white glue over the top of the paper. Then let it dry completely. 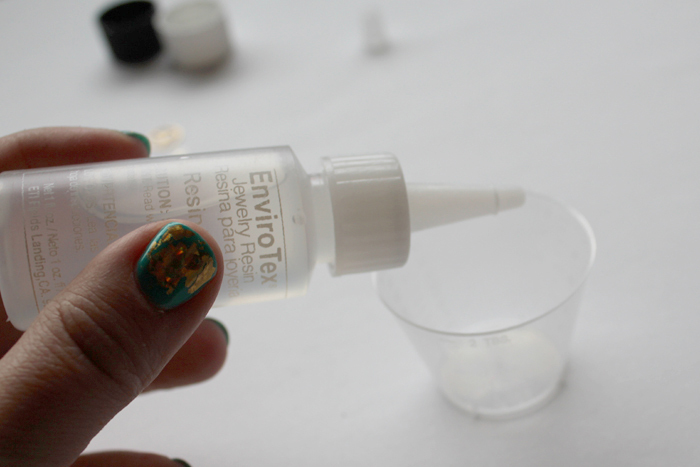 Next, open your EnviroTex Jewelry Resin and read the instructions. Reading the instructions each time is the best way to ensure a proper execution. It comes with resin and hardener in separate bottles. This is a 1:1 ratio. It comes with 2 mixing containers as well. Start with the Resin. Pour exactly to the desired line. I filled to the first line. Then add the hardener, exactly the same amount. I filled to the next tick line. Then use one stick and stir for 2 full minutes. Then pour the contents into the other cup and stir another full minute with the other stick. Now it is ready. It has about a 25 minutes usage period before it becomes too hard to use. Use the stick to drip out a little bit into the bezel. 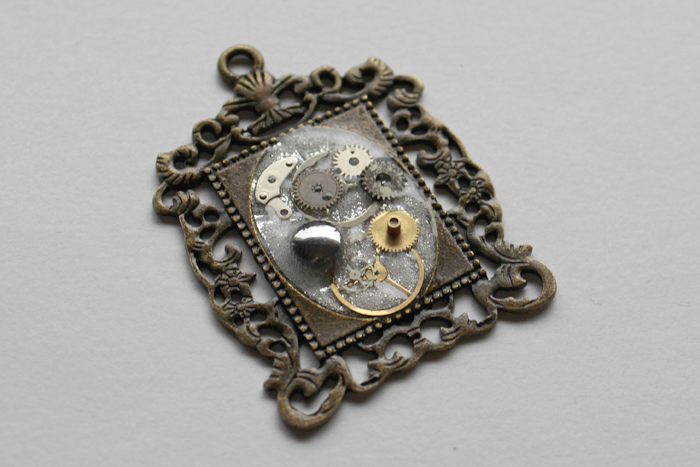 I used the stick to spread around a thin layer of resin before adding the gears. 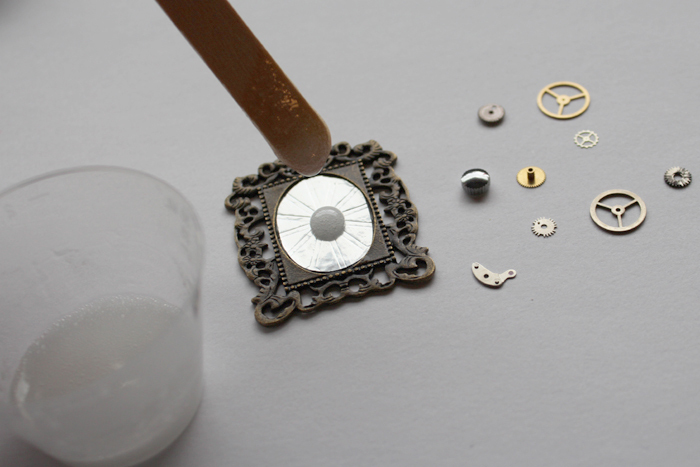 Once they are in place, use the stick to drip more resin on the bezel, right on top of the little watch pieces. 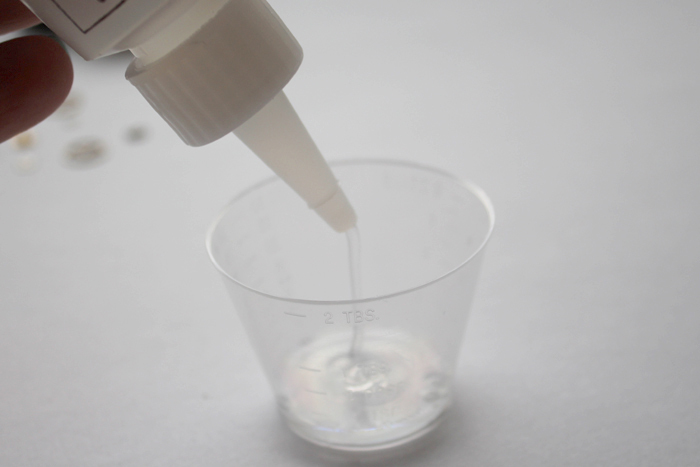 The resin will create a doming effect, like when you fill a cup of water all the way to the brim and the surface tension holds it all in place. Then let it set up. It is self de-gassing, so the air bubbles should pop by themselves after about 30 minutes. After 30 minutes if there are still bubbles on the surface you can use a lighter or small butane torch to remove any remaining bubbles. Then let it set up overnight. Next add a length of chain hooked together with one jump ring. 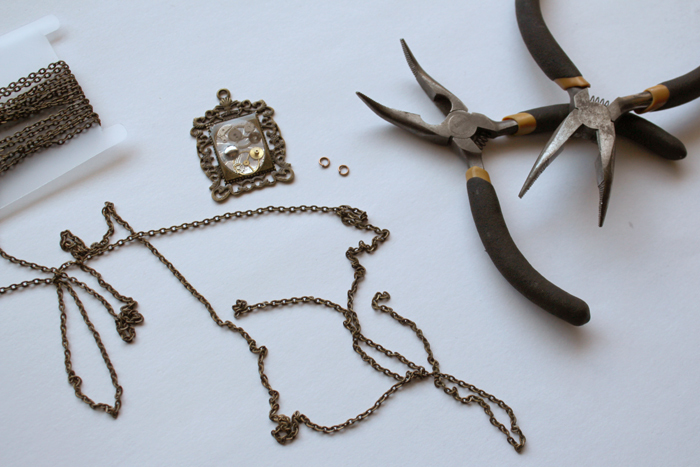 Then attach the bezel to the chain with the other jump ring and the jewelry pliers. Enjoy! 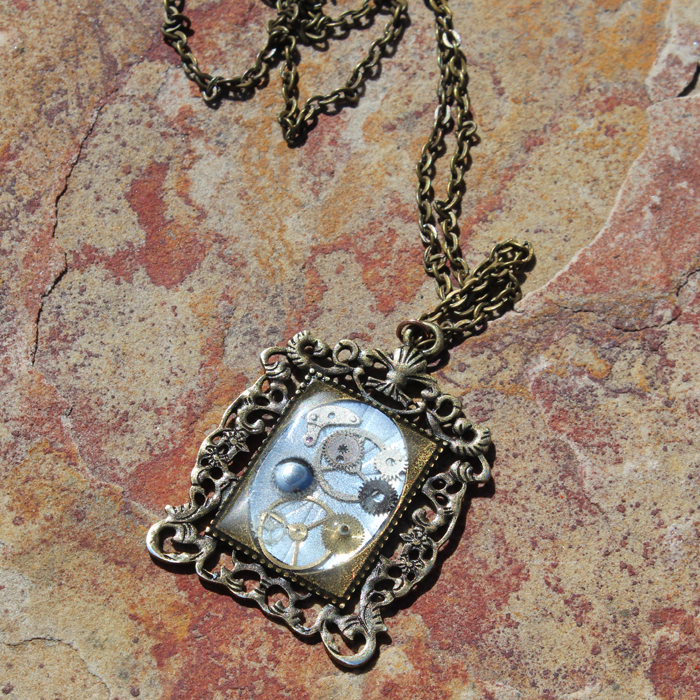 It looks fancy and intricate–perfect for a Steampunk vibe! 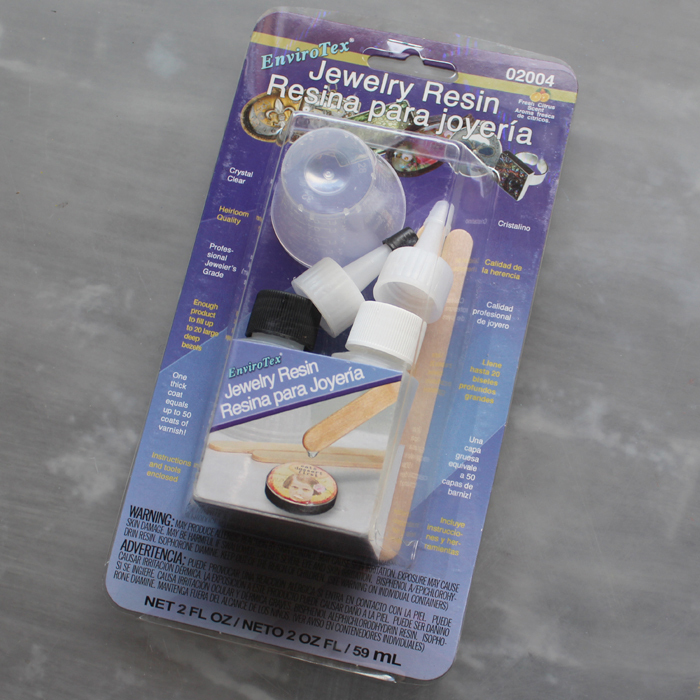 If you haven’t ever tried jewelry resin, give it a try! 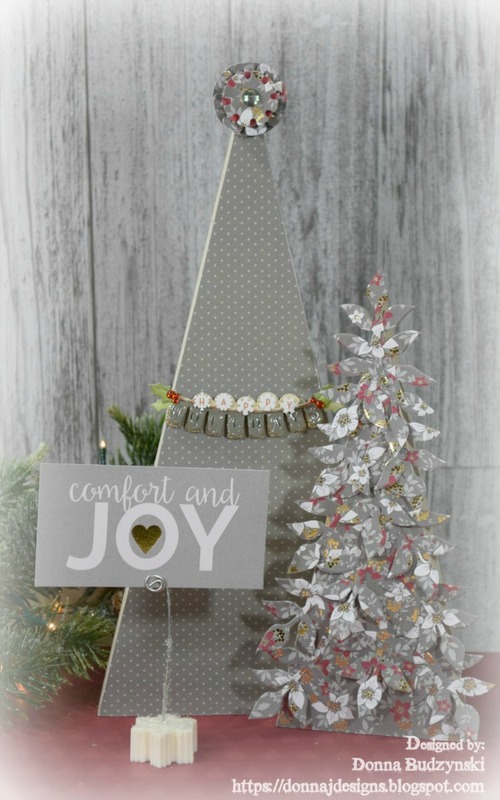 This is a perfect beginner resin project and looks spectacular! Easter is often thought of a a pastel and sugar-coated mess just for children. But even though it can be that, it is also often a chance for us to let out our creative sides. Whatever your particular aesthetic preferences, there are some amazing crafts that you can make to fit your design. From traditional childhood crafts to more unique designer motifs, there is a craft for everyone. Check out these 17 Creative Easter Crafts for Every Home. I can barely wait to get my hands in our garden and start planting some flowers and vegetables! Some of the first plants to go in will be these herbs I picked up at our local nursery. I’ve always wanted to make my own little plant labels, something simple and cute that I could reuse year after year and maybe pass on to my girls down the road. I saw these really cute DIY stamped clay garden markers and wanted to try making something similar, but with a touch of colour. Follow these steps to make one plant label at a time as it is easier to get the components to completely blend together in smaller amounts. Be sure to completely read the instructions provided in the packaging prior to starting. Also, protect your working surface with a sheet of wax paper. Use two wood sticks to take equal amounts of components “A” and “B” from the containers (be careful not to cross mix the materials in the containers). 3. Spread some of the release agent on your gloves to keep the keep the clay from sticking. Form the clay into balls of approximately equal size by eye, a little larger across than a quarter coin. 4. Press together and completely blend the two balls until they are a uniform colour with no ribbons or marbling (about 1-2 minutes). Press out any little clumps to make sure the components are completely combined. 5. 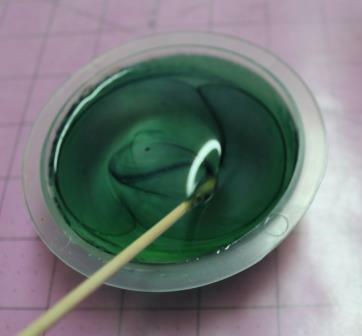 If desired, add three drops of the Transparent Dye in a colour of your choice. Blend the Dye into the clay completely or just partially to achieve a marbled finish in the end. 6. 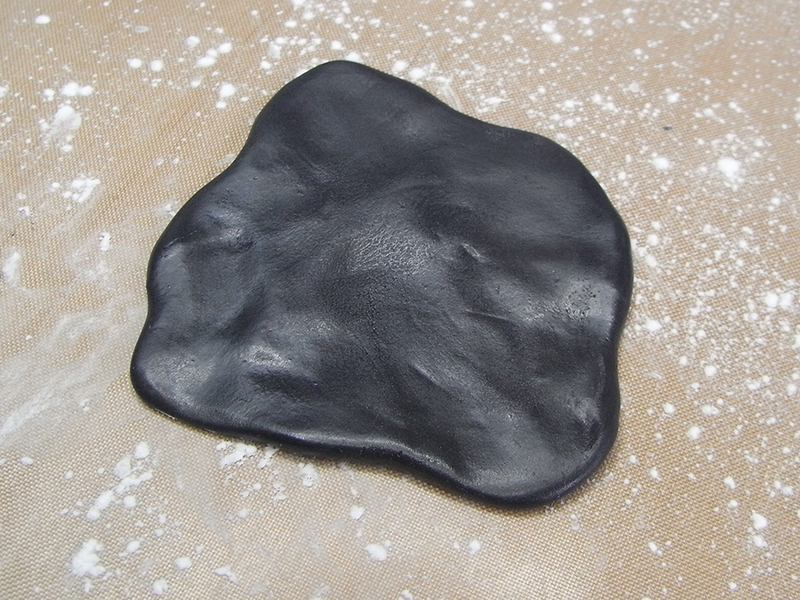 The clay will start to get softer and stickier at this point (great to use as an adhesive in this state!). Form the clay roughly into a 6″ long cylinder. Repeat this process to make as many herb garden markers as you’d like. Let the Easy Sculpt clay cure for at least 2 hours before proceeding to the next step. After about two hours check on the hardness of the clay. The pieces should still be malleable but not too soft. 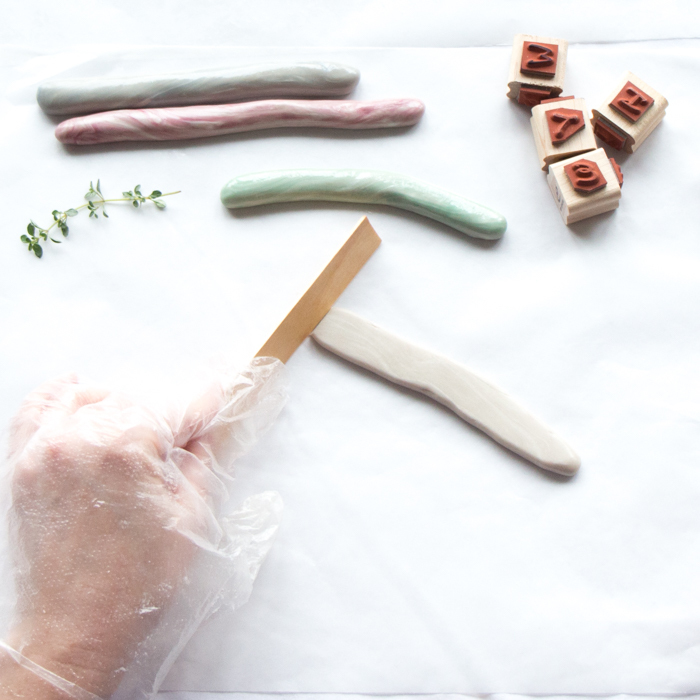 The Easy Sculpt clay will reach a soft but firm cure within 5 hours of mixing, so you have a good amount of time to reform and shape the clay to make the DIY plant labels. 7. Use a flat surface such as the wood craft stick to flatten the clay cylinders to about 1/4″ thickness. 8. Snip a bit of clay off of the top for a more rectangular shape and then cut an angle off the bottom to create a point. 9. Use alphabet rubber stamps and gently press the names of your herbs onto each plant marker. 10. Finally, if you’d like, you can also press a sprig of the herb onto the plant label to make a subtle impression. The nice thing about the slow cure time for the Easy Sculpt Modeling Clay is that if you make a mistake, or don’t like how something looks, you can smoosh it back up into a ball and start all over! Once happy with how your DIY plant labels look, let it cure overnight (fully cured in 24 hours). I’m so pleased to have these new little decorations for my herb garden. I love the slightly marbled effect of the Transparent Dye and then they’ll add a subtle touch of colour to my otherwise all-green herb garden. I think I’ll make a set to give my mom as a gift for Mother’s Day as well! 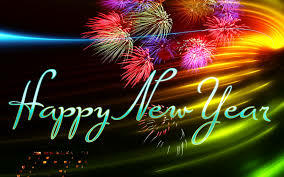 Wonderful and Happy New Year! 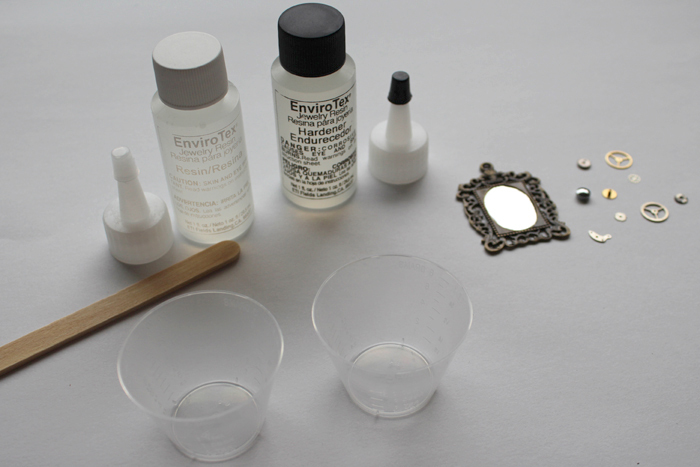 Today Designer Myléne Hillam share how to create Marble Coasters using EnviroTex® Lite. · Painters drop sheet (polyethylene) Instructions: Before beginning, put on your gloves to avoid getting sticky whilst working with the resin. Protect your work space with the painter’s drop sheet. 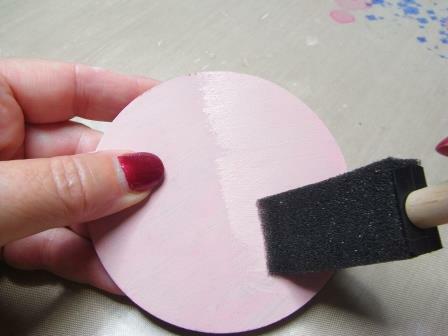 Use the foam brush to paint all surfaces of the coasters with Spring Rose paint. Allow them to dry several hours before continuing. Follow the package instructions to mix up 2oz EnviroTex Lite. Pour 1/4oz into one cup, 1/3oz into the second cup and 1/2oz into the third cup. Color the first cup with Cherry Royale and Red Oxide paint, the second with Nimbus Grey and the third with Spring Rose, using only enough paint to make the resin opaque and stirring it thoroughly until it is mixed in. 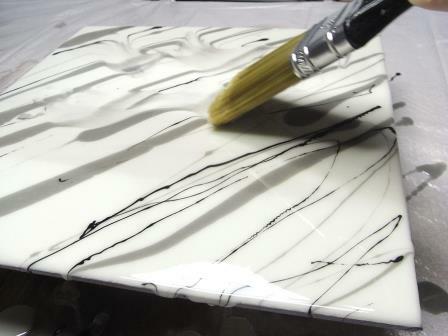 Color the remaining resin with only enough Warm White paint to make it opaque. 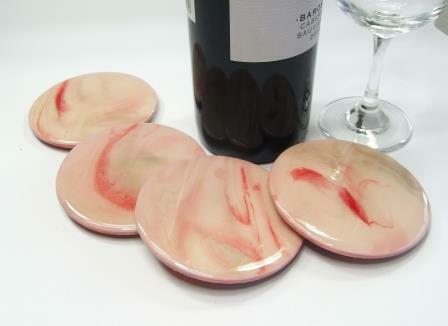 Place each coaster on an inverted cup and pour the white resin over the surface of each one. Spread it to the edges. 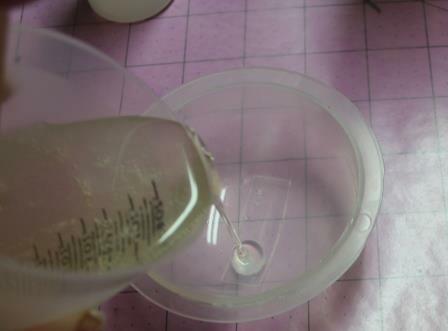 Pinch the top of the cup of the pink resin and pour it in a thin stream across the white resin at an angle. Repeat with the gray resin. Dip the wooden stir stick into the red resin and drizzle it thinly across the coasters. 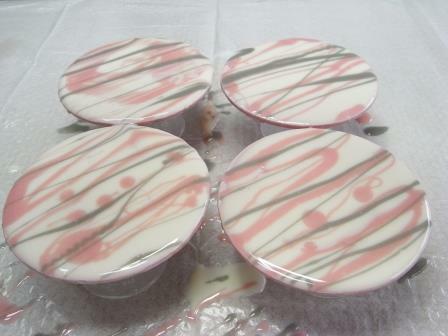 Use a paint brush from the mixing cup set to swirl the colors lightly. Take care not to over mix them or they will become muddied. Hold the coasters vertically to allow the colors to run and blend into each other and run off the edge. Turn them in another direction to create some more movement. Set them back on the cups and pop any bubbles by sweeping the butane torch across the surface. Remove any drips from the underside with a stir stick. Set the coasters aside to cure. Repeat Steps 2 – 6 to marble the reverse of the coasters, coating with only enough resin to go to the edges of the coasters without overflowing. If there are any drips, clean them up with denatured alcohol and a Q-Tip. Allow the coasters to cure. Mix 1oz EnviroTex Lite, pour it across the coasters and spread it out to the edges making sure that it does not run off the edges. Pop any bubbles by sweeping the flame across the surface and set them aside to cure. Repeat Step 9 on the reverse side of the coasters. Attach four surface protectors to the back of each coaster. 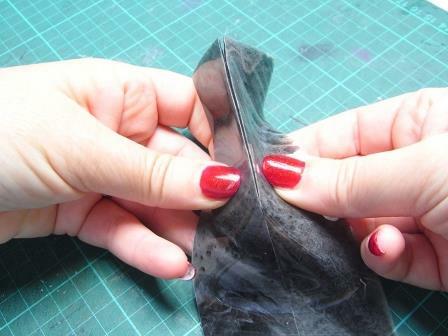 Instructions:Before beginning, put on your gloves to avoid getting sticky whilst working with the resin. Protect your work space with the painter’s drop sheet. Use the foam brush to paint all surfaces of the coasters with Spring Rose paint. Allow them to dry several hours before continuing. Follow the package instructions to mix up 2oz EnviroTex Lite. Pour 1/4oz into one cup, 1/3oz into the second cup and 1/2oz into the third cup. Color the first cup with Cherry Royale and Red Oxide paint, the second with Nimbus Grey and the third with Spring Rose, using only enough paint to make the resin opaque and stirring it thoroughly until it is mixed in. 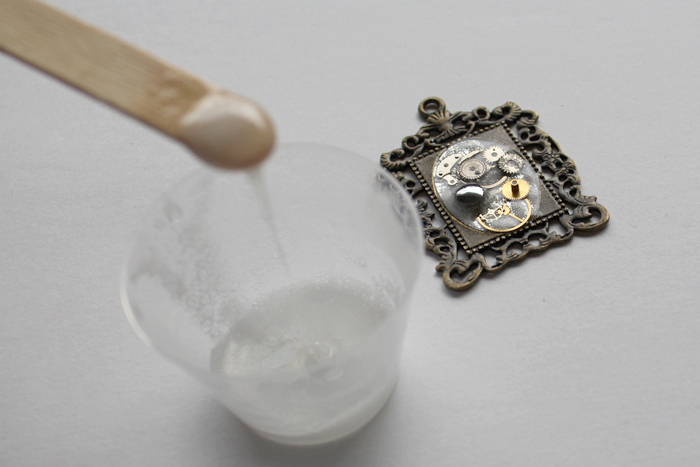 Color the remaining resin with only enough Warm White paint to make it opaque. 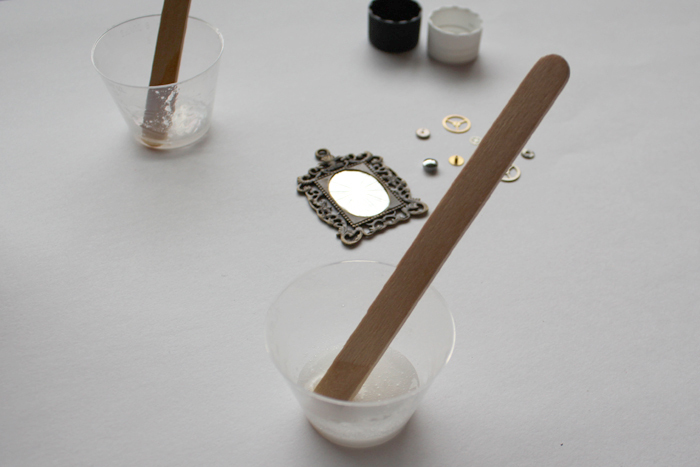 Place each coaster on an inverted cup and pour the white resin over the surface of each one. Spread it to the edges. 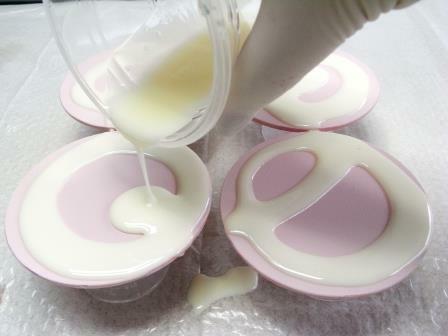 Pinch the top of the cup of the pink resin and pour it in a thin stream across the white resin at an angle. Repeat with the gray resin. 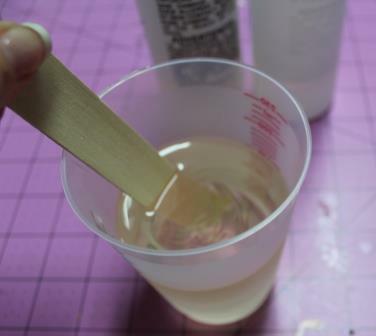 Dip the wooden stir stick into the red resin and drizzle it thinly across the coasters. 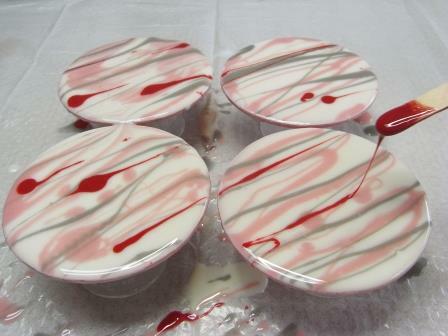 Use a paint brush from the mixing cup set to swirl the colors lightly. Take care not to over mix them or they will become muddied. Hold the coasters vertically to allow the colors to run and blend into each other and run off the edge. Turn them in another direction to create some more movement. Set them back on the cups and pop any bubbles by sweeping the butane torch across the surface. Remove any drips from the underside with a stir stick. Set the coasters aside to cure. Repeat Steps 2 – 6 to marble the reverse of the coasters, coating with only enough resin to go to the edges of the coasters without overflowing. If there are any drips, clean them up with denatured alcohol and a Q-Tip. Allow the coasters to cure. Mix 1oz EnviroTex Lite, pour it across the coasters and spread it out to the edges making sure that it does not run off the edges. Pop any bubbles by sweeping the flame across the surface and set them aside to cure. Repeat Step 9 on the reverse side of the coasters. Attach four surface protectors to the back of each coaster. 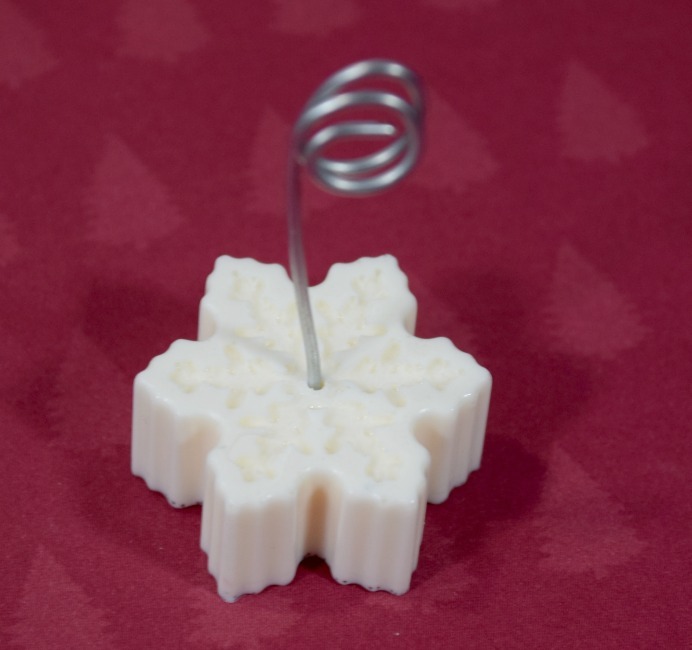 On Tuesday I shared how to make a mold for a Christmas ornament using Silicone Putty and today I will share the results of using the mold.Here is the finished mold. I decided to use FastCast™ to create an ornament, FastCast™ is such a great product because it sets up in just 10 minutes. Measure out equal parts of parts A and B.
Stir together for 30 seconds. Pour into a second mixing cup and mix for another 30 seconds. This additional step insures a complete and thorough mix. Then, immediately pour into your mold. 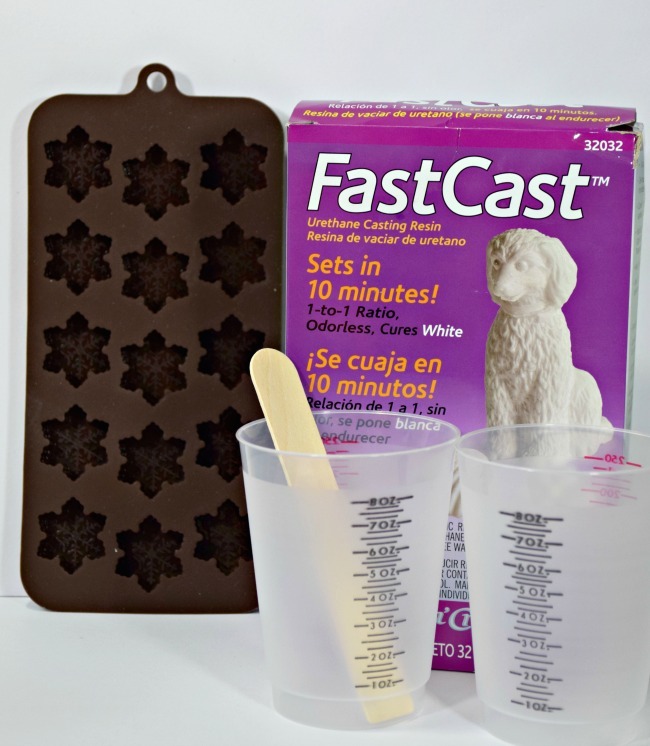 As FastCast™ begins cure, the mixed solution with heat up and begin to turn a dull white. 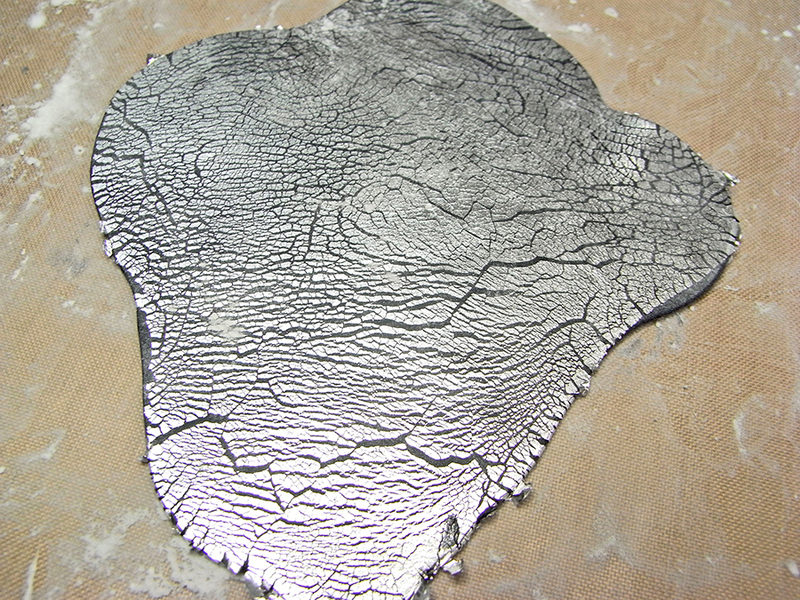 Once cast (about 10 minutes) the piece will become bright white in color. Results, a perfect resin ornament. I painted the ornament with Sapphire Iridescents. To finish off, I applied craft glue onto the holly, berries and cap of the ornament and covered with glitter. Let dry and hang. Until you have a uniform color. Press it into the Silicone Putty. Let sit for 20 minutes. Remove the ornament to revile the mold. 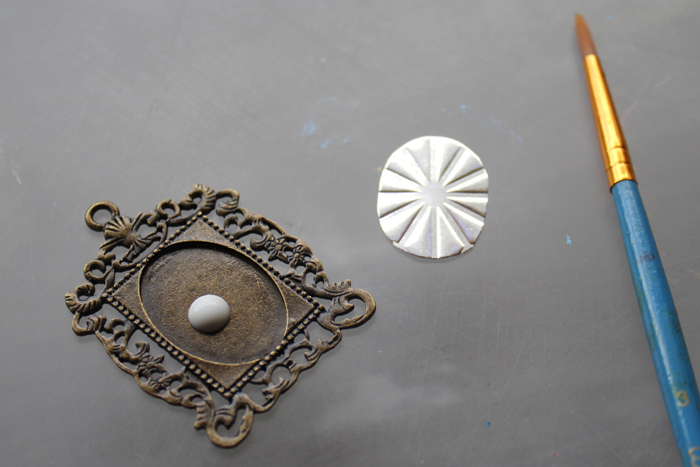 Check back Thursday to see how an ornament turns out. 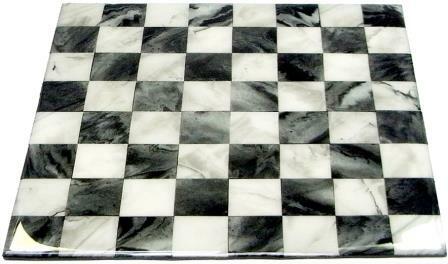 Today we have a beautiful Faux Marbled Chess Board Designed by Myléne Hillam. This would be a wonderful gift idea for anyone on your list! 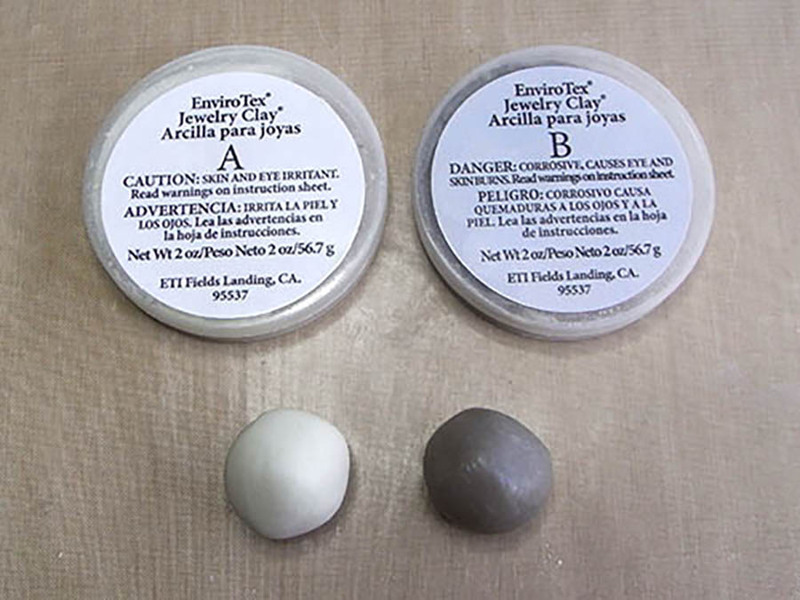 Materials Required: · EnviroTexLite® · Acrylic paints: Warm White, Nimbus Grey, Black · Two 11” square wooden boards · ETI Mixing Cup Set · 4 plastic party cups · 4 wooden stir sticks · 3” paint brush · Foam paint brush · Butane torch · Cutting mat · Stanley knife · Ruler · Latex gloves · Painter’s tape · Painters plastic drop sheet (polyethylene) · Cello tape Instructions: Before beginning, put on your gloves to avoid getting sticky while working with the resin. Protect your workspace with the painter’s drop sheet. Cover both the boards with the drop sheet plastic and stretch it taut across the surface. Tape it on the back. 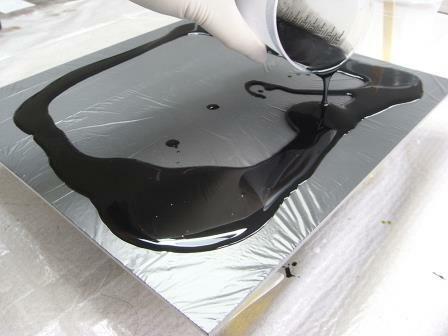 Create the black marble: Follow the package instructions to mix up 8oz EnviroTex Lite. Pour 2oz of mixed resin into each of two cups. Color one cup Warm White and the other Nimbus Grey, using only enough paint to make the resin opaque and stirring it thoroughly until it is mixed in. Color the remaining resin with only enough black paint to make it opaque. Place the wooden board on inverted cups making sure it is balanced. 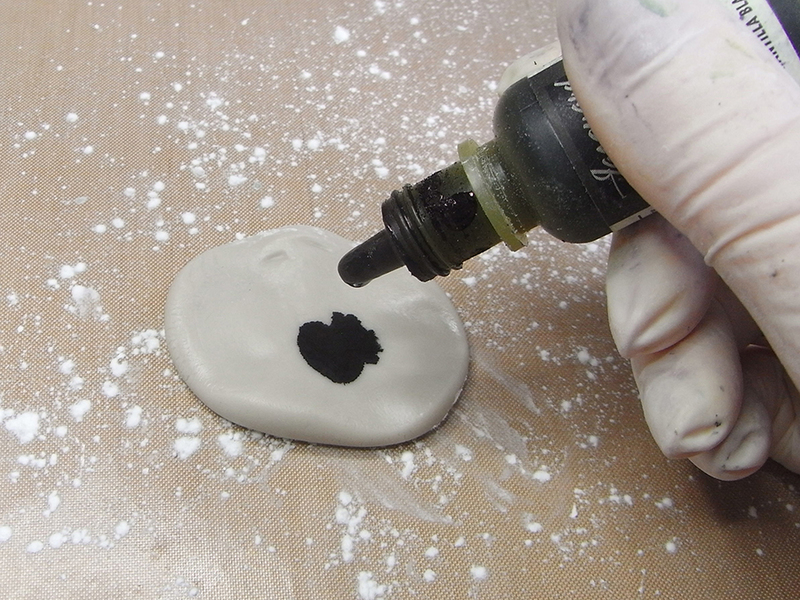 Pour the black resin across the surface and spread it out to the edges. 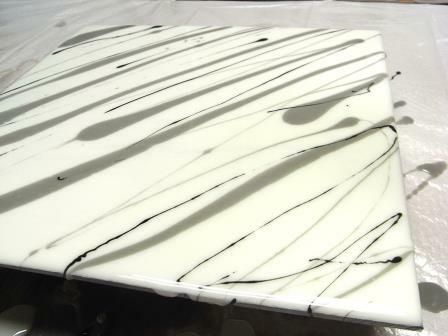 Pour the white resin in a thin stream across the black resin at an angle. Repeat with the gray resin. Use a paintbrush to swirl the colors lightly. Take care not to over mix them or they will become muddied. Hold the board vertically to allow the colors to run and blend into each other and run off the edge. Turn the board in another direction to create some more movement. Pop any bubbles by sweeping the butane torch across the surface. Set the board aside to cure. 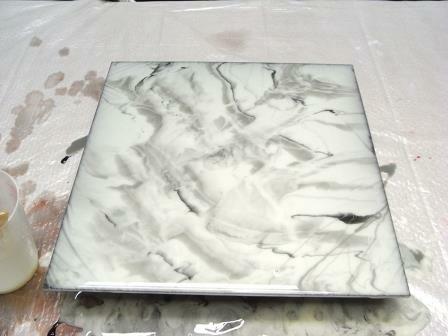 To create the white marble: Mix 8oz EnviroTex Lite and pour 1oz of mixed resin into one cup and 2oz into another. Color the first cup with black paint and the second with gray, using only enough paint to make the resin opaque and stirring it thoroughly until it is mixed in. Color the remaining resin with only enough white paint to make it opaque. 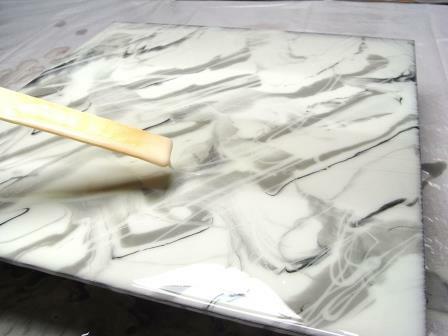 Pour the white resin across the surface of the second board and spread it out to the edges. Pour the gray resin across the white resin in a thin stream. Use the stir stick to drizzle thin lines of black paint across the surface. Swirl the colors lightly with the paintbrush. Drizzle more white resin across the surface with the stir stick. e the squares to your workspace, keeping them in the same order. Mix up 4 oz of EnviroTex Lite. Pour it across the painted board and pop any bubbles. Working quickly, reposition the squares on the board. Push them into the resin, allowing the resin to ooze over the tiles. Spread the resin across the surface evenly and pop any bubbles. Keep checking on the board over the next two hours and realign any squares, which might move. If the chessboard surface is uneven, mix up another 4 oz of EnviroTex Lite; pour it across the surface and pop any bubbles. Today we have a beautiful Faux Marbled Chess Board Designed by Myléne Hillam. This would be a wonderful gift idea for anyone on your list! Instructions: Before beginning, put on your gloves to avoid getting sticky while working with the resin. Protect your workspace with the painter’s drop sheet. Cover both the boards with the drop sheet plastic and stretch it taut across the surface. Tape it on the back. 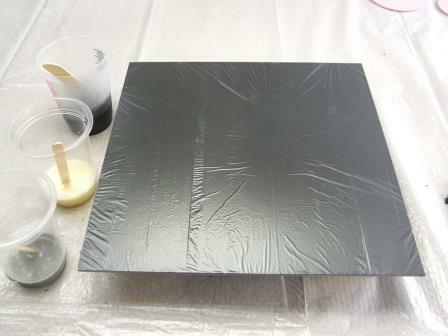 Create the black marble: Follow the package instructions to mix up 8oz EnviroTex Lite. Pour 2oz of mixed resin into each of two cups. Color one cup Warm White and the other Nimbus Grey, using only enough paint to make the resin opaque and stirring it thoroughly until it is mixed in. Color the remaining resin with only enough black paint to make it opaque. 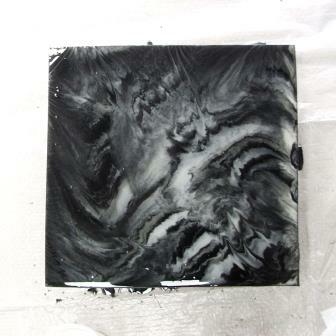 Pour the white resin in a thin stream across the black resin at an angle. Repeat with the gray resin. Use a paintbrush to swirl the colors lightly. Take care not to over mix them or they will become muddied. Hold the board vertically to allow the colors to run and blend into each other and run off the edge. Turn the board in another direction to create some more movement. Pop any bubbles by sweeping the butane torch across the surface. Set the board aside to cure. 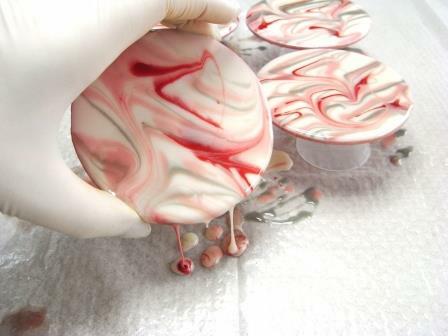 To create the white marble: Mix 8oz EnviroTex Lite and pour 1oz of mixed resin into one cup and 2oz into another. Color the first cup with black paint and the second with gray, using only enough paint to make the resin opaque and stirring it thoroughly until it is mixed in. Color the remaining resin with only enough white paint to make it opaque. Pour the white resin across the surface of the second board and spread it out to the edges. Pour the gray resin across the white resin in a thin stream. 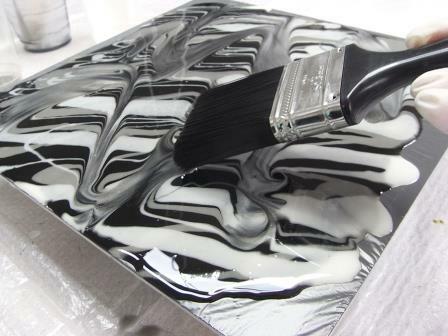 Use the stir stick to drizzle thin lines of black paint across the surface. Swirl the colors lightly with the paintbrush. Drizzle more white resin across the surface with the stir stick. Pop any bubbles with the torch and set the resin aside to cure. 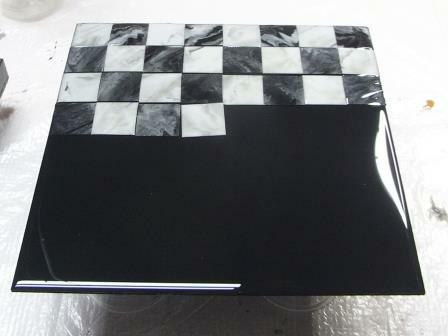 Once cured, remove both the black and white marble sheets from the plastic. 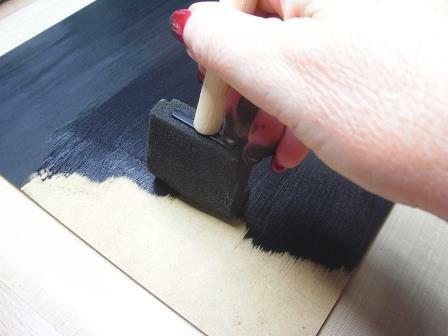 Use the foam brush to paint all surfaces of one of the square wooden boards with black paint. Allow it to dry several hours before continuing. Mask the underside edges with painter’s tape. Score each of the marble sheets down the center with the knife. To cut the resin apart, fold it along the score line and it should easily pull apart. If not, score it a little deeper. Cut one half of each marble sheet into 4 equal strips and then cut these strips into squares. You should have 32 black and 32 white squares. Lay out the pieces on the painted board in a checkerboard pattern and check for fit. Remove the squares to your workspace, keeping them in the same order. Mix up 4 oz of EnviroTex Lite. Pour it across the painted board and pop any bubbles. Working quickly, reposition the squares on the board. Push them into the resin, allowing the resin to ooze over the tiles. Spread the resin across the surface evenly and pop any bubbles. Keep checking on the board over the next two hours and realign any squares, which might move. If the chessboard surface is uneven, mix up another 4 oz of EnviroTex Lite; pour it across the surface and pop any bubbles. 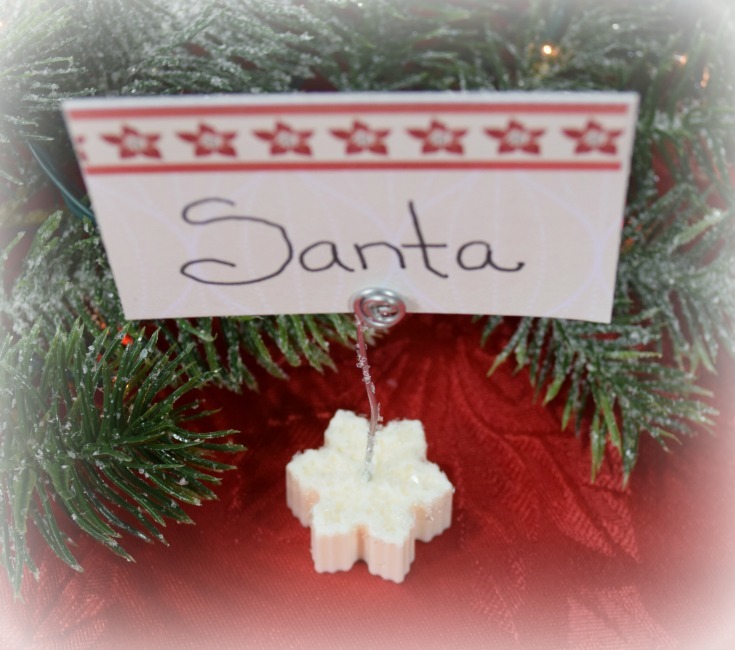 Looking to create some handmade Christmas gifts? 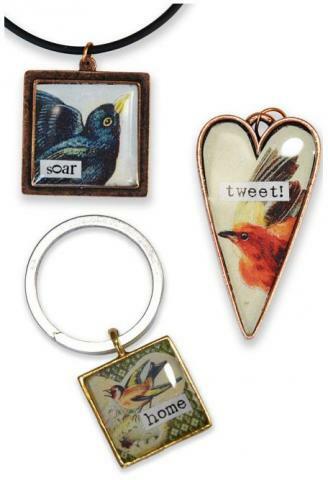 Check out these easy to create pendants designed by Marie Browning. 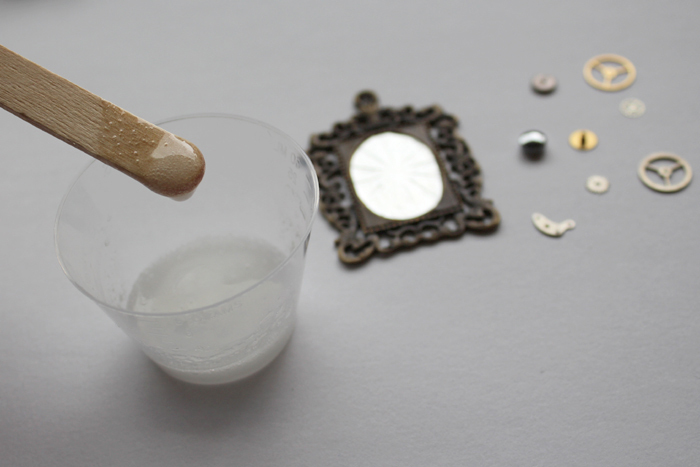 Apply white glue to the back of the paper pieces, then place them into the pendant’s. Allow glue to dry. Seal paper pieces with two coats of white glue. Allow the glue to dry clear between coats. Wear gloves throughout this project because we’re coloring the Jewelry Clay with several drops of alcohol ink and it will be quite messy. re a magical combination but why not experiment with a different resin color and use gold, copper or variegated leaf in place of the silver – you’ll be amazed at how different the result is! 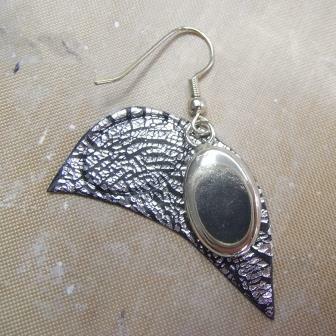 Today we have a beautiful Foiled Pendant and Oval Earring set created by Myléne Hillam using Jewelry Clay and Jewelry Resin. Instructions:Measure out equal parts of Part A and Part B and mix the two parts together thoroughly until no marbling remains. Add two drops of alcohol ink and mix it into the clay. Add two more drops of alcohol ink and work it into the clay thoroughly. Roll into a ball. Flatten the ball out with your fingers. Dust the Teflon sheet liberally with talcum powder and place the clay on the talcum powder. 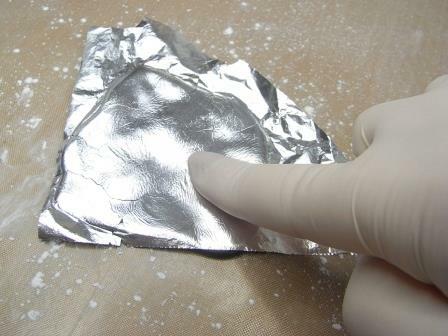 Place a sheet of the silver leaf onto the surface and use your fingers to press it into contact with the clay. Dust the second Teflon sheet with a light dusting of talcum powder to prevent the clay from sticking. 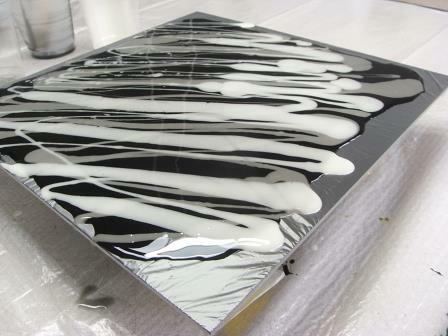 Roll the acrylic roller gently across the surface and watch the silver leaf crack as the clay stretches. Magic! Remove the Teflon sheet from the top and carefully lift the clay off the Teflon sheet to make sure it doesn’t stick. Add more talcum powder if necessary. Continue rolling the clay until it is 1/8” thick taking care that the exposed clay doesn’t stick to the top Teflon sheet. 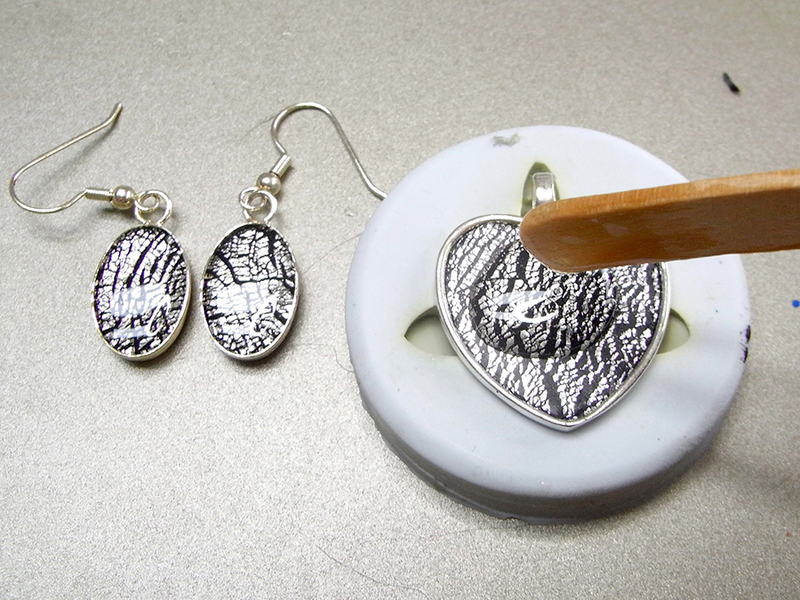 Press the bezels lightly into the surface of the clay to give you a cutting guide. 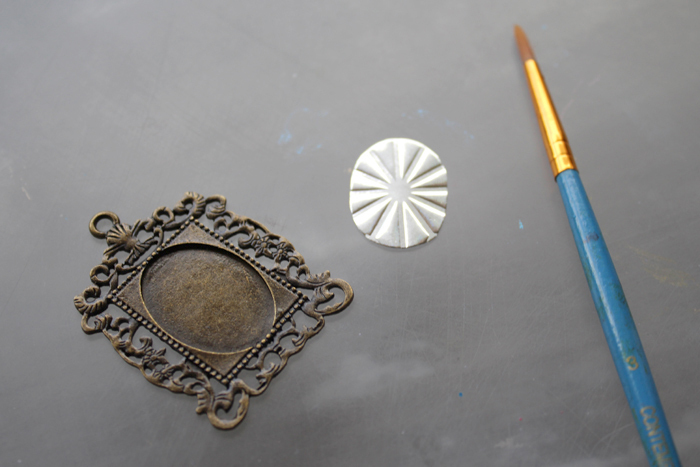 Trim the shapes with the craft knife and then check that they fit inside the bezels. Trim until they fit the bottom of the bezels and press them down gently and evenly. Set them aside overnight to cure. 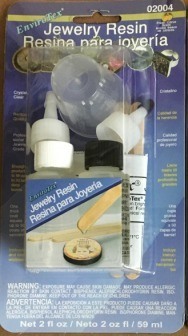 Mix 1 oz of the Jewelry Resin following the instructions on the package. Use a wooden stir stick to scoop the resin onto the surface of each of the bezels allowing it to dome slightly above the top of the bezel. Cure, for 24 hours, before wearing. 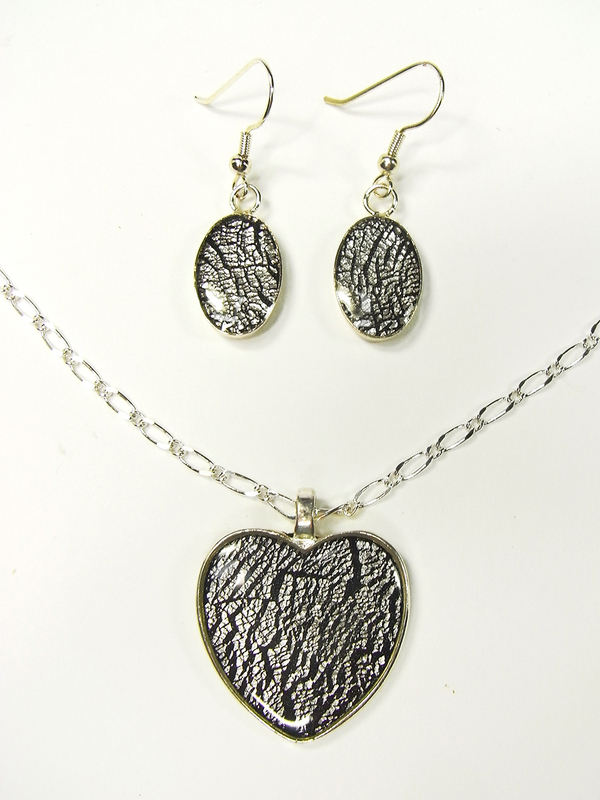 Black and silver are a magical combination but why not experiment with a different resin color and use gold, copper or variegated leaf in place of the silver – you’ll be amazed at how different the result is! 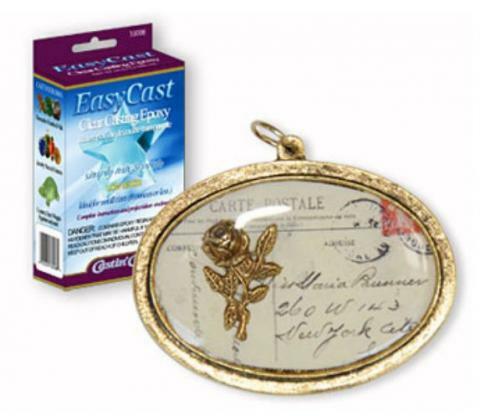 I am always on the lookout for Silicone Molds to use with EasyCast®. To my surprise, when visiting my mom this week, I found she had bought a great silicone mold, that would be perfect for coasters, ornaments and more...With the holidays right around the corner, for today's project, I decided to create a glittery snowflake Christmas ornament. Measure out equal amounts of part A and part B, stir together for 2 minutes. Pour into a second mixing cup and stir for another minute. Add a bit of glitter. Use a lighter to remove air bubbles if needed. Set aside to dry for 8 - 12 hours. 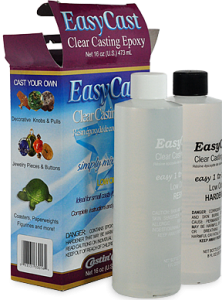 Mix together 1 ounce of the EasyCast®, as directed above. 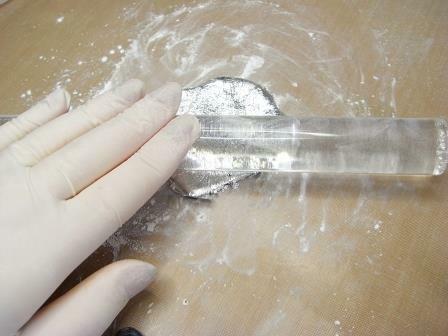 Pour a small amount of the mixture into the mold, over the dried glittered resin. 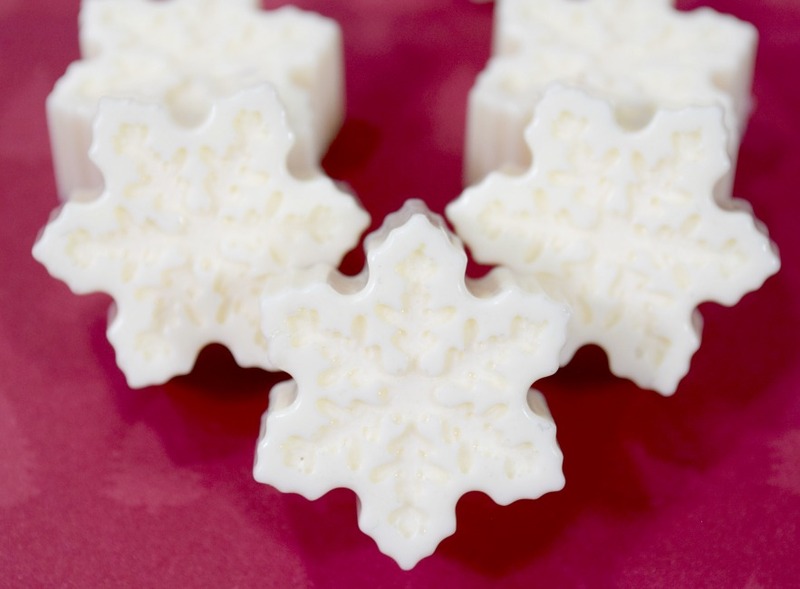 Use a toothpick to place the snowflakes into the resin. 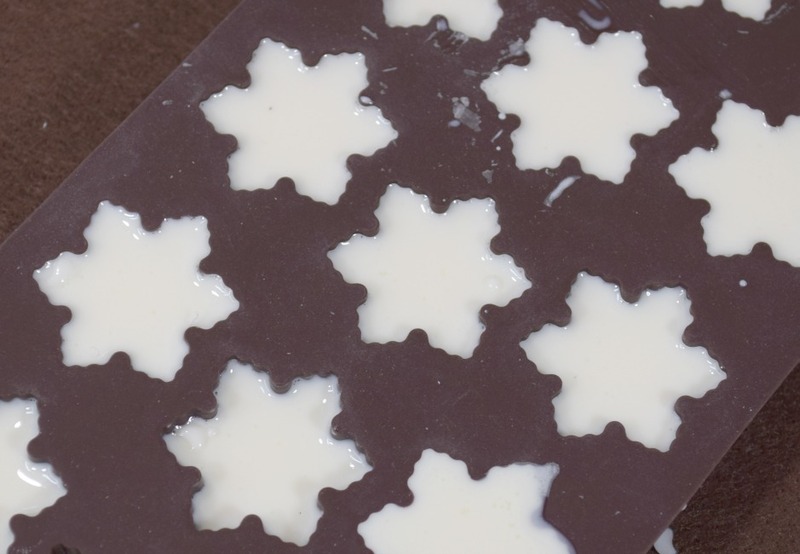 Arrange them in the mold. Set aside to dry for 24 hours. Drill a small hole at the top of the ornament. Glue a piece of ribbon into the hole to create a hanger. Enjoy!! 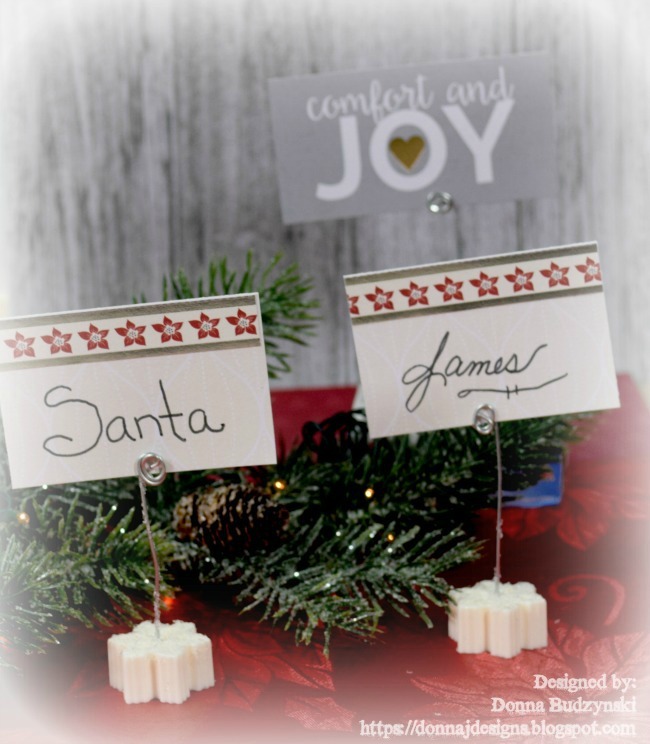 Hi All, Donna here, I am going to show you how to make some beautiful Holiday Place Card Holders! These are so easy and FAST! 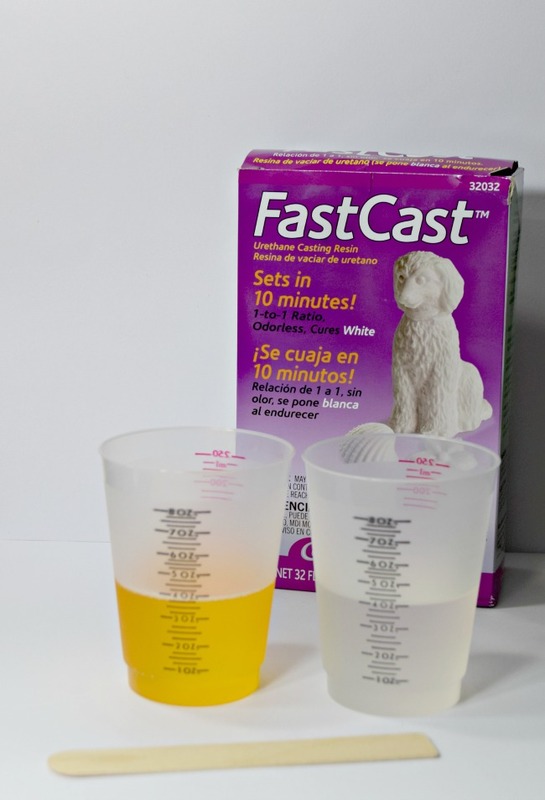 Measure equal parts of Fast Cast™ into a mixing cup. They are beautiful straight out of the mold. Using a small drill bit to fit the wire. 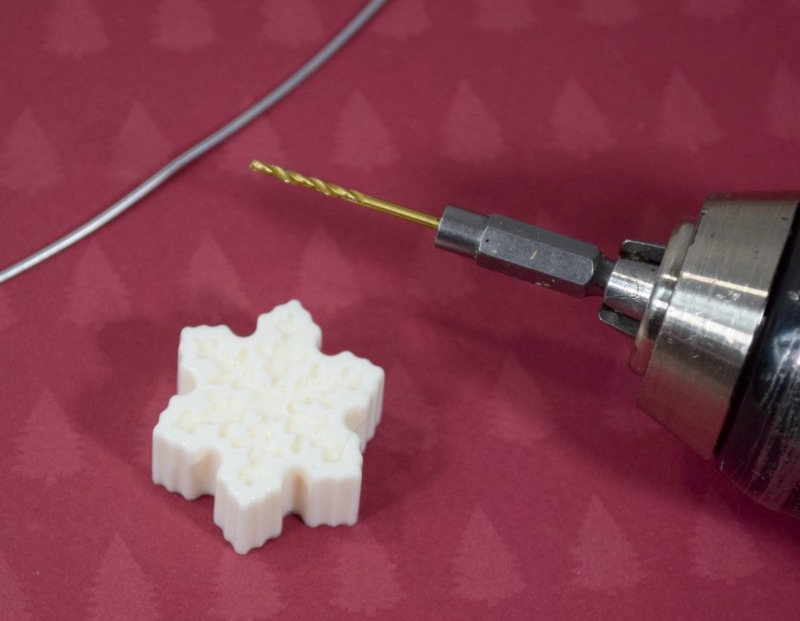 Drill a hole in the center of the snowflake. Using the needle nose pliers cut the wire to length desired and curl one end.Adhere into the hole using glue. 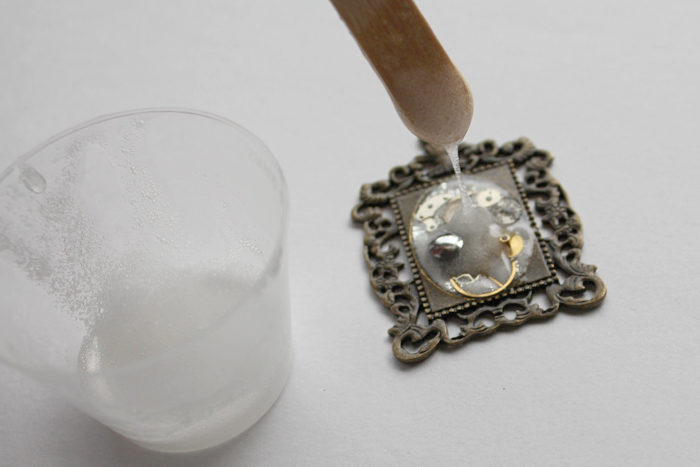 Once dry, water down some white glue and lightly brush on snowflake and wire. Dip into or pour glitter glass over it. Let dry. While drying you could make your place cards. I cut a 2" X 3" piece of cardstock from DCWV. 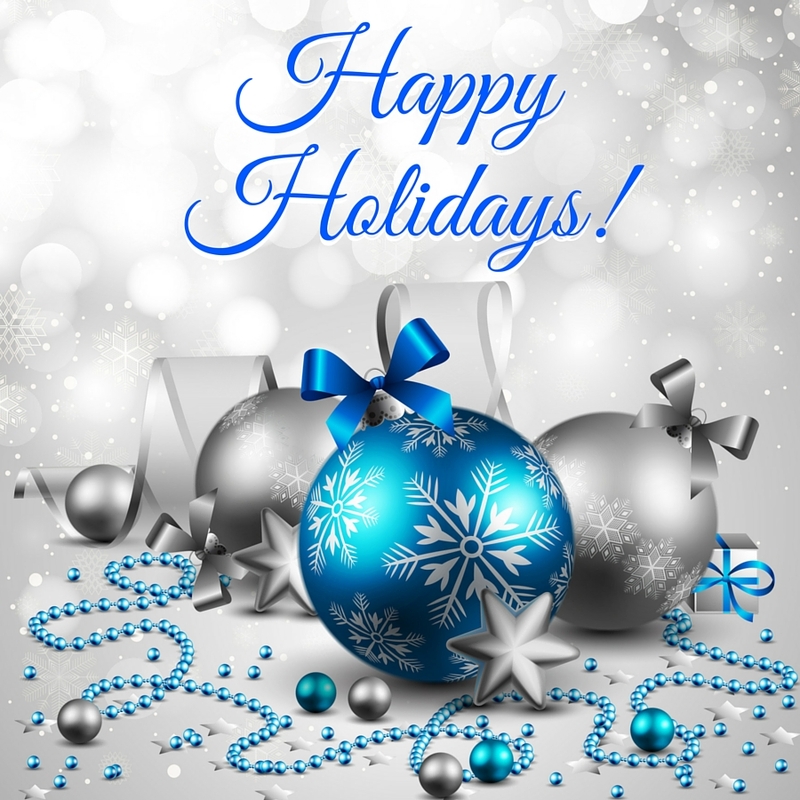 Here are a few of the ways you could use these for the holidays! Thanks for joining me and I hope you enjoyed today's project! 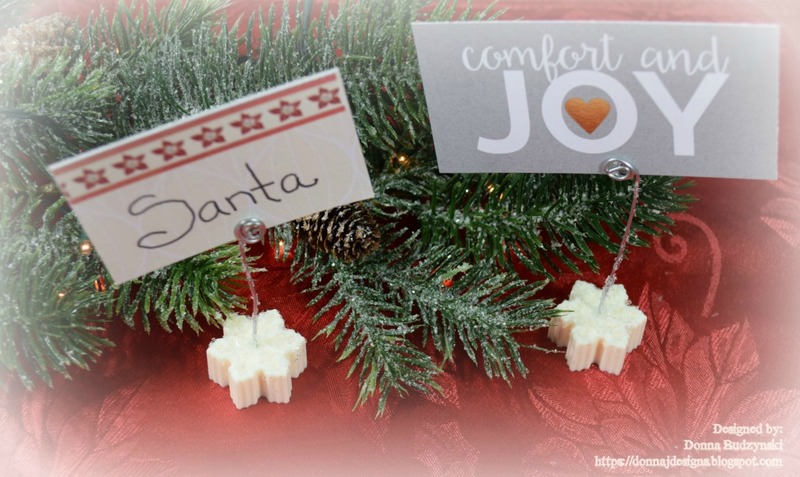 I would love for you to try this fun and easy project for the holidays! Resin paper weights are amazing! Each one is an original one-of-a-kind piece of ART. Since I have been using alcohol inks in some projects lately, I thought I would see how they worked for a paper weight. The results are a transparent paper weight when looking through it. Project Instructions: Spray mold with mold release. 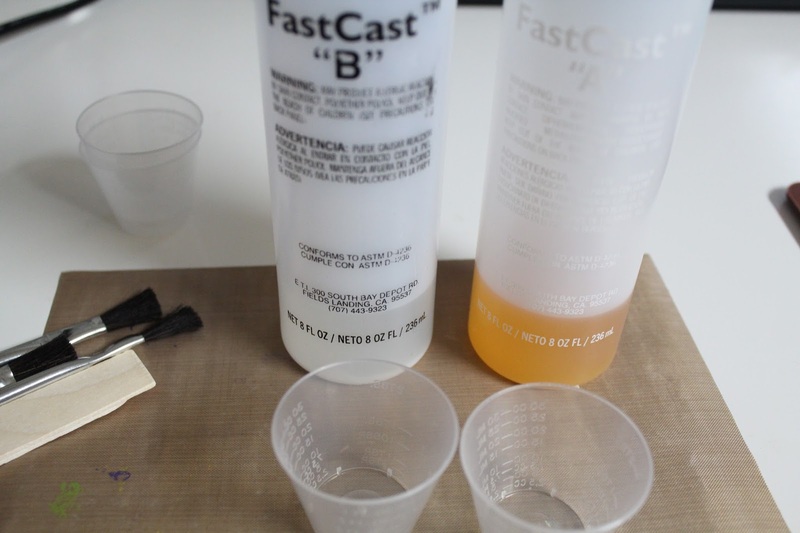 Measure out equal parts (1 ounce each) of EasyCast resin and hardener. Then, stir together for 2 minutes. Pour mixture into a second cup and stir for another minute. Pour resin into mold. Add a couple drops of the alcohol ink. Gently stir the alcohol ink. Use a lighter to remove any air bubbles that rise to the top. Let set for 24 hours. Remove from the mold. I love how transparent it seems in the light, From this photo you can see that it looks a bit layered. From this photo you can see that it appears a bit darker. What is cool about this paper weight is that it looks different from every angle. Give this a try and enjoy! Project Instructions: Spray mold with mold release. Measure out equal parts (1 ounce each) of EasyCast resin and hardener. Then, stir together for 2 minutes. Pour mixture into a second cup and stir for another minute. Add a couple drops of the alcohol ink. 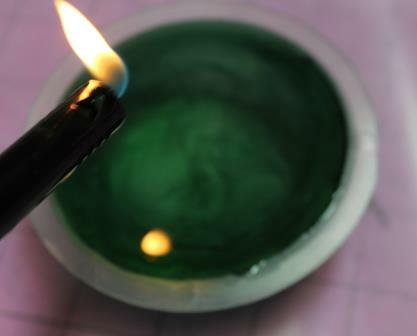 Gently stir the alcohol ink. Use a lighter to remove any air bubbles that rise to the top. I love how transparent it seems in the light, From this photo you can see that it looks a bit layered. From this photo you can see that it appears a bit darker. What is cool about this paper weight is that it looks different from every angle. Give this a try and enjoy! Hello, Resin fans! Karen here with a tutorial on making a fast & easy resin necklace.The beauty of this is you can customize it to match your outfit. This would also make great gifts for Christmas. To make this we are using a new product from ETI called Fast Cast Resin and it sets up in 10 minutes!!! 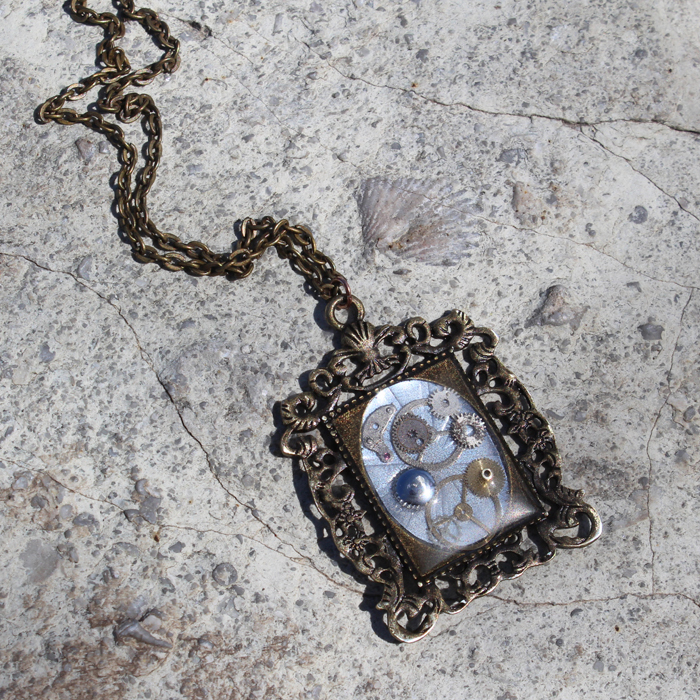 Here is my finished necklace. 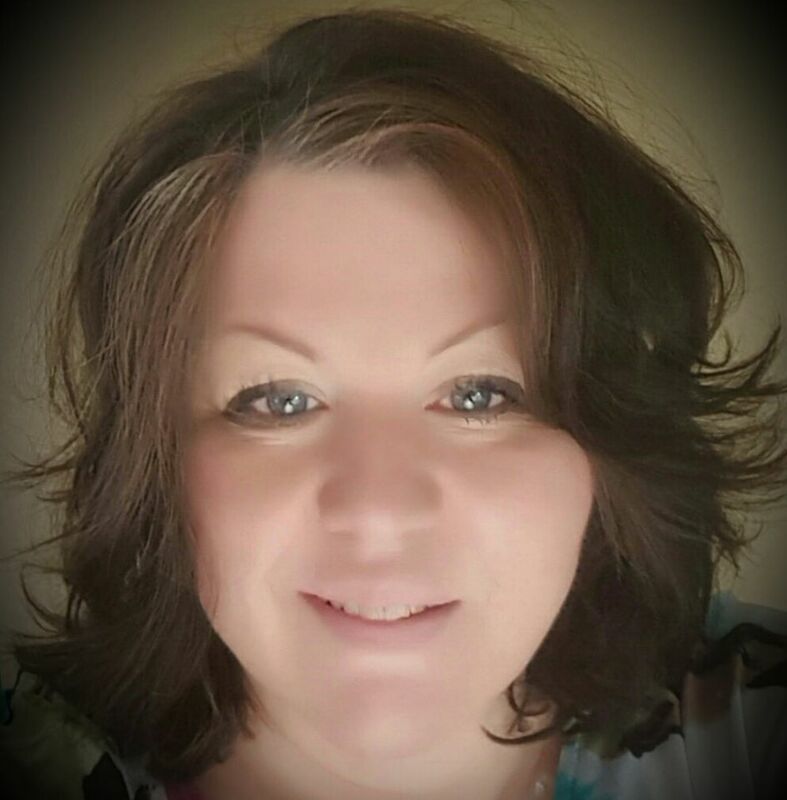 Love the color, love the style & especially love how easy it was to make! This Fast Cast Resin is a game changer! Materials: Fast Cast Resin Easy Cast Jewelry Mold Mold Release & Conditioner Mixing cups Stir sticks Gloves DecoArt Media -Fluid Acrylics, Metallic Lustre Carabelle Stamp Archival Ink Yarn Copper Wire Project Instructions: First, you need to have all your supplies ready to go.